Here is another adventure in the On the Road with Bunkycooks series. This time we went to a berry farm. You know how much the Bunkycooks love fresh fruit (especially really fresh, just picked fruit! ), so what could be more fun than picking our own berries in the sweltering heat on a lovely Summer day? 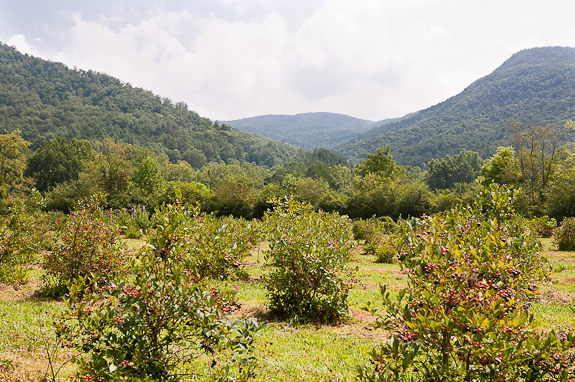 We did not go to just any berry picking place, we went to the Jordan’s River Road Farms in Franklin, North Carolina! I have to tell you right off, that our first meeting with Lenny Jordan was an awkward one. I had contacted Lenny and Jean Jordan about doing some berry picking, but did not realize that they send out a weekly email called a “Berry Alert,” advising when it’s okay to come and pick their berries. So, not knowing that slightly major fact, one day while we were over in the Franklin area, we decided to pay River Road Farms a visit and go picking! I had at least sent an email telling them I was coming, so I assumed it was okay. I had called and left a message, too! We drove up and saw the farm and a house next door. We saw a tent and lots of buckets to put your berries in. 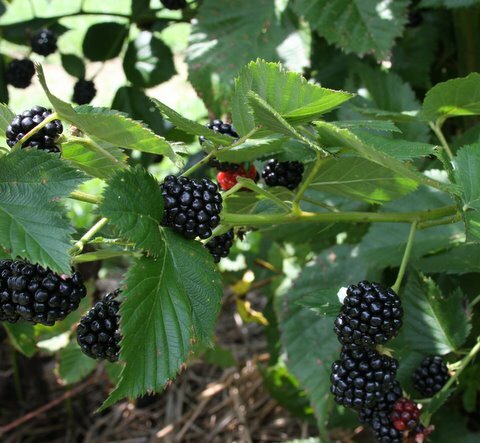 However, after much berry picking, we then were not quite sure how to pay for them since nobody was home and there was no place to leave the money! Later on we found out that the farm belongs to the Jordans, but the house on the property belongs to their friend! 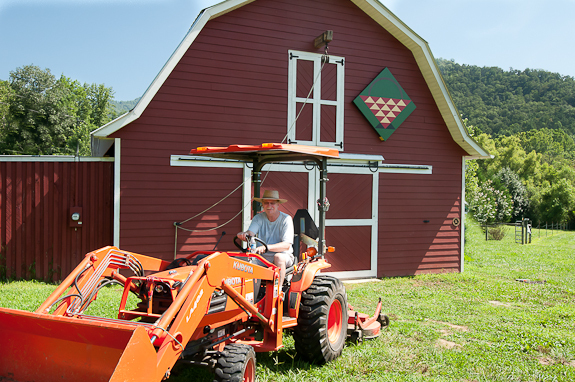 Mr. Bunkycooks really wants this tractor! Now, we had been berry bad (I just had to say that) and we were feeling pretty weird, so we called their number again and didn’t get an answer. Maybe they take IOU’s just like Karen at The Lick Log Mill Store?! So, needless to say, our first face to face meeting was when Lenny got to meet the Bunkycooks (alias berry thieves)! 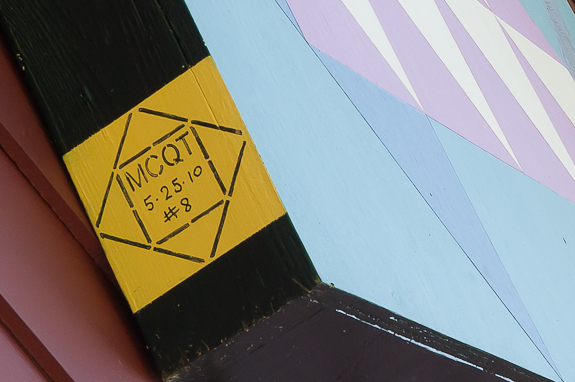 Their Macon Country Quilt Patch is of a Berry Basket! Very cute! I have to say that the Jordans’ story is another fascinating one. Lenny was an Executive with a very large corporation based in Atlanta, Georgia. In 1999, Lenny and Jean Jordan bought a home up on the mountain in Franklin, North Carolina. Lenny told us that as they would look down into the valley below their home, they kept seeing much of the land in the valley being taken up by new housing. So one day, they decided to buy a piece of that land to preserve it and turn it into a farm! This photo is courtesy of River Road Farm. 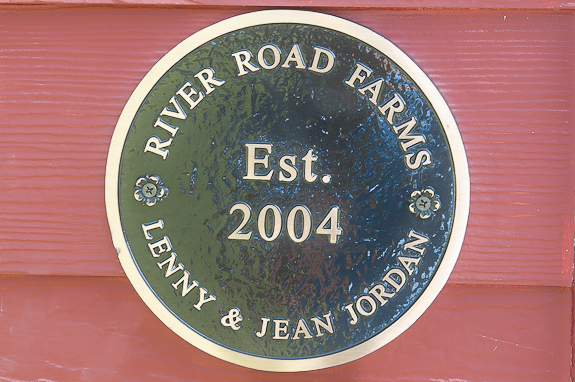 The land on what is now River Road Farms was purchased in 2004 and the Jordans, who retired three years ago, grow blueberries, blackberries, various veggies, herbs and really pretty flowers. The blueberries and blackberries are the primary crops, but every now and then Lenny will pop a few peppers in your bag along with some other goodies! 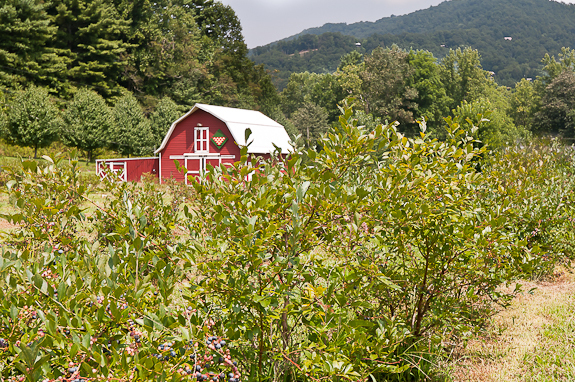 This farm was truly born out of a love for the land and a desire to preserve it as well as giving back to the community by providing a place where local people can come and pick fresh berries (like the Bunkycooks!). Lenny says that one of his fondest memories is of a little girl that came to pick berries with her family. At the end of the visit her bucket was empty but her clothes and face were covered in berry juice! 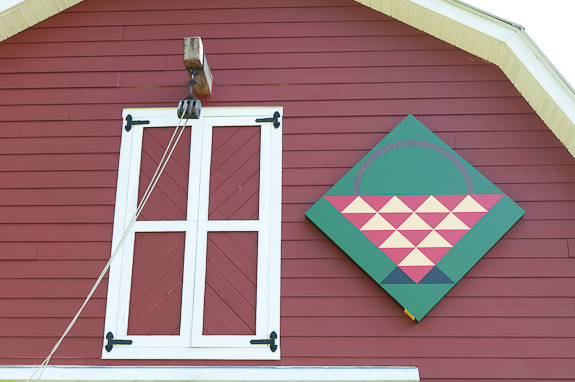 River Road Farm is #8 on the Macon County Quilt Trail. Mr. Bunkycooks has become quite the “Cover Boy” in these ‘behind the scenes, on the road’ posts! Cute story – glad you didn’t get arrested! Beautiful photos, as always, love the rustic table and the red barn, especially since it also serves as a pub on those hot days! I’ll be drinking beer with the boys, thank you! River Road Farms berry patch! This year, in June, Lenny and Jean hosted our annual family reunion (nearly 50 strong) so we all got to sample some of the early crop. You write so entertainingly as well as provide yummy-looking recipes. And I can see that you already appreciate the Jordan part of our family clan. Keep up the great blog and your commitment to down-home freshness. Thank you so much Doris! We really have gotten to know Lenny (especially) after hours of berry picking and chatting. We Think the farm is really special and that your family is awesome for buying up the land and preserving it for others to enjoy. I loved your comment on Jean and Lenny’s farm. I enjoy so much going picking blueberries. My husband and I had the pleasure to meet them a few years ago and grow fonder of them at each encounter. Please keep my e-mail address for future blogs. I will try the crisp recipe for a coming diner party. Have a great summer. Thank you for your comment. I will email you the info on how to subscribe to future posts. Lenny and Jean are incredibly nice people and we are fortunate to have met them. From another sister/sister-in-law of Jean/Lenny: Thanks for your great blog! What more could you ask for than wonderful, warm people, delicious organic fruit, and a nurturing love of the land! I loved learning more about berries…how much fun to sample each bush of berries before selecting the one with the sweetest treats! I wish I could have visited this farm with you. Thank you for sharing a lovely dessert recipe! I might have to give this a try over the weekend. Our family picked at the River Road farm for the second time this year in what has become an annual event that we all look forward to each summer. Lenny indeed is a wonderful guy whose berries are excellent and whose heart is in the right place. He even watched our infant daughter under the shade of his tent while my wife and I picked berries with our older daughter! Great farm, great people, great berries! Seriously, great write up, great pix. We’re proud. I don’t know what else to say, but LOL!!! I sooo wish I had a picture of that when we opened the barn door in 96 degrees and there they were! Wish I had known about that deal…I would have been there, too! What a fun article! I am a grateful niece of Jean and Lenny who appreciates their labor of love! Very entertaining article–I learned several things I didn’t know–thanks so much! Just priceless Gwen, just priceless! I can just imagine the looks on your faces when you realized there was no where to pay and you’d picked PAILS of berries – LOL!! Glad you got a chuckle out of this one! It is funny looking back, but we sure felt a little weird at the time! Yikes! Thank you Cristina. I am glad you enjoyed this post. We are having so much fun with all of the adventures and they truly are adventures! 🙂 I was also really glad to learn about the red color in the blackberries. Lenny told us that just the year before his berries were entirely the dark color, so it doesn’t take long for the cross pollination to occur. Sometimes your posts can almost bring a tear to my eye. I lived in North Carolina for ten wonderful years and though I’ve come to love, love, love Colorado, seeing these pictures, remembering the many trips my girlfriends and I would take to harvest berries of all sorts; makes me very homesick. Funny, I’m from St. Louis but never get that feeling; maybe because we built our home from the first scoop of dirt to having both my girls being born there. I said it yesterday, will say it again…a part of my heart will always remain in NC. Oh, and the food! Small world, my neighbor just brought me over part of a pan she had made of a mixed berry crisp. I’m addicted! I know you love and miss NC because we have chatted about that several times. It is truly a beautiful state and this area where we are is particularly special. I hope you will come this way sometime and visit and see your beloved NC again! Thank you so much for sharing River Road Farm with us. Great post and awesome crisp! I love love love berries. Think you could send me a plate? Back home mom and dad had raspberry bushes. Oh my I loved picking and eat right off the bush. Ooh! That was a little awkward, but kinda funny 🙂 Love the crisp and all those gorgeous berries!! I really am so envious that you have access to so many farms!!! What a hilarious tale… berry berry nice indeed! I love it! Love the picture of the crisp too…Rustic & moorish! Wish it were berry season in India sometimes too! What a great story! I’m glad you were able to smooth things over and get your berries 🙂 I’ve been contemplating making a crisp for a while now and this may be inspiration I need! I want to add that Lenny and Jean brought blueberries and jam to my 60th birthday in Indiana. Lenny picked them I think for the first time. Ha They were wonderful and I still have some after a week. They are both quality people that are the heart of our midwest upbringing and you are all lucky to have them in Franklin. Great stewards of our land. Don’t forget that great honey too. Thank you for the comment. Lenny and Jean are great folks and we are lucky to have them nearby! I still have some blueberries in my fridge, too. It’s amazing how long they last when you pick them fresh! Gwen – oH YUM! 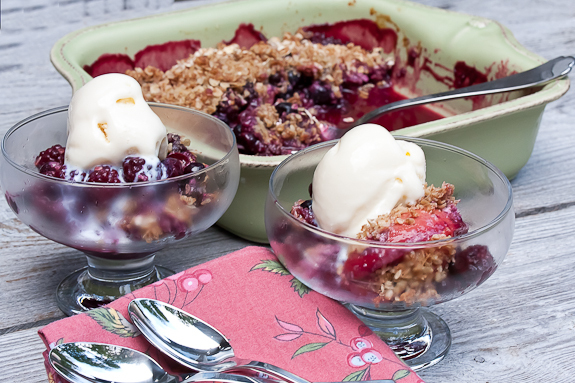 Look at all that bounty with fresh berries and peach crisp – looks lovely! Hilarious ! berry-picking thieves indeed 🙂 Loving the series so keep it coming. Glad you are enjoying the adventures of the Bunkycooks. We are having fun with it and meeting some really nice people along the way! There are few things better than fresh picked berries… and then using them to make a fantastic dessert. I love this series of posts you’ve written! Perfect use of some wonderful fresh fruit. Great post. Ooh you’re just like a couple of pesky birds, flying in and stealing all the best berries! 😀 I love how friendly they were despite the confusion. fun adventure and the crisp looks wonderful!